Want to find out what the main players in the beauty industry think of SkinBase™? 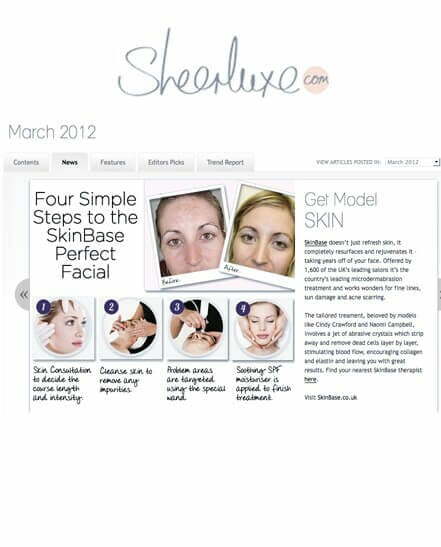 Here you’ll find out exactly what the press have been saying about The SkinBase Facial™ treatment. Vogue loves The SkinBase Facial. As word continues to spread through the beauty world that the SkinBase Facial is the only treatment worth having – we’ve been reviewed and featured in the fashion and beauty bible that is Vogue magazine. If there was ever a magazine which proves just how simply fabulous the SkinBase microdermabrasion treatment is, it’s this! So get yourself, your mum and your friends booked in. It’s been approved by the very best in beauty. Find your nearest therapist here now. When one of our favourite, luxury magazines, Sheerluxe asked if their Features Editor Esme could test a course of the SkinBase treatments after hearing rave reviews, we couldn’t wait to hear what they would have to say. This is the online magazine to rival the likes of Vogue, Cosmopolitan, Vanity Fair and many more. Needless to say, we really wanted to impress! Nervously, we waited until Esme had had all 6 of her SkinBase treatments, at just 27 years old, we wondered just how much of a transformation the SkinBase facial would have. When the feature was finally published, we simply couldn’t believe how much she loved the treatments. Plump, wrinkle-free, clear and flawless skin remained and Esme and the Sheerluxe team are officially our biggest fans. “After my third treatment I started to get compliments, by the fourth my boyfriend commented on how insanely soft my face was, by the fifth my skin was noticeably glowing and by the sixth I was convinced that the fine lines which were causing me so much grief had been significantly reduced. What’s more, the results have lasted and all I’ll need to maintain the results is one monthly treatment. Find your nearest SkinBase therapist today and get the beautiful skin Esme got. We’re so delighted that the Italians (who know just a thing or two about beauty!) have fallen in love with The SkinBase Facial. This month we got a double paged spread in popular beauty magazine ‘La Pelle’, amazing! The article interviewed SkinBase owner and founders, Rich and Leesa Faulkner to find out exactly why they began the company. Though we’re sure many of you are fluent in Italian (like we are of course, uh hem…) we’ve translated the piece for you just in case. We put some questions to Richard Faulkner, who founded SkinBase in 2005 with his sister Leesa. What differences have you found between the beauty market in Italy and the UK? Italy is a wonderful country and we decided to export our product here before we took it to France because we love the kindness and hospitality of the Italian people. We have found that in Italy there is less regulatory framework when it comes to beauty therapy compared to the UK, but at the same time we have noticed that your beaurocracy can make it almost impossible for therapists to open a salon. Despite this, however, Italians really seem to embrace beauty and rejuvenation and there are 15% more salons in Italy than the UK. Why did you decide on microdermabrasion? Through a process of exfoliation and regeneration of the skin using very fine crystals of aluminium oxide to gentle abrade the skin removing dead skin cells layer by layer. Using a vaccum action the treatment also promotes blood circulation to the treated area, stimulating the production of collagen and elastin, making the skin firmer and giving a more youthful appearance. Anything else to add about SkinBase? Just one thing: if a customer decides to buy their own machine we offer an industry best four year manufacturer’s warranty. We design and manufacture the machine in England and we therefore have stocks of any spare parts ready for immediate despatch. Who can say better than that?! If you’d like to get hold of the SkinBase PAYG machine get in touch now. As if you needed anymore convincing, our SkinBase treatment was tried and tested by the Beauty Editor of all four mags before the write up – we confess we got a little nervous when we found the review was out! But as usual, the treatment did the talking and even the beauty editor herself said that her skin was noticeably clearer and brighter after just one session – amazing! If you’re looking for a really quick, painless alternative to chemical peels to reduce the risks of pigmentation, signs of ageing, acne scarring and even stretch marks, this is for you. The SkinBase Facial is an safe, controlled treatment that intensively exfoliates and resurfaces the skin. A fine jet of abrasive crystals gently removes dead skin cells layer by layer and a vacuum action hoovers away the debris, stimulating the blood flow and encouraging collagen and elastin formation. Result? Firmer, revitalised and youthful looking skin. Sounds good? Feels good too! A bit tingly but skin appearance after just once session was clearly improved, imagine what a full course could do for you! Costs around £30 a session or £150 for a course of 6. So, looking for microdermabrasion in Essex, Surrey, Tunbrisdge Wells, Brighton or anywhere else in the UK for that matter? Find your nearest SkinBase therapist here. Who: The SkinBase campaign is fronted by 90s ladette to lady, Zoe Ball but developed (thankfully) by scientists. Why: Promising to pummel unruly skin into submission, as well as effectively treat acne scars, open pored and fine lines, this facial sounds like something special. After a consultation with a therapist, a fine jet of abrasive crystals is applied with a wand, gently removing dead skin cells layer by layer, while a vacuum action lifts away the debris. It’s certainly not uncomfortable although ladies-what-spa might find it on the rough and ready side. A relaxation treatment this is not (although it’s always nice to lie down for 40 minutes). The crystals are worked over the entire face (eye area excepting), stimulating blood flow to the skin and encouraging collagen and elastin formation. Unlike traditional facials that layer product over product, this one actually strips away the worn layers of skin so that your fresher skin is revealed and creams and potions can penetrate further. After a 30-minute treatment my skin was a little pink, but incredibly soft. Any swelling was hardly visible and I was ready to get back to the office. The next day, my face was taught and smooth, and any fine lines had either retreated to some deeper level where they couldn’t be zapped, or they had actually been erased. Quite incredible. This was the first treatment, and SkinBase recommend a course of up to eight. I signed up the next week. How much: It varies from salon to salon, but around £40 for an individual treatment and £99 for a course of three. Would you go back? I’ve already paid in full. Book in now. Find a SkinBase therapist here. Having tried a microdermabrasion facial quite some time back, I jumped at the chance to try one from another brand, SkinBase. My previous experience was of clear, gorgeously smooth skin after an hour’s painless exfoliation and a moisturising mask. SkinBase, I found, is a different kettle of fish to the other microdermabrasion treatment I tried – the machine looks and sounds much the same, and the microdermabrasion material is a similar crystal based product – but that’s where the similarity ends. Where the former facial was akin to someone vacuuming my face, the SkinBase machine felt much more intensive – there was still the tickly feeling, but also a bit scratchy, and on areas of thinner skin (such as my neck). As before, particular attention was paid to my more, ahem, congested areas. I was surprised to find that the treatment included my neck – I’d never really considered having it treated the way my face is pampered, but I did find that my neck felt much firmer after the treatment – worth the little bit of pain! Overall, my face felt incredibly firm, and incredibly smooth (again, much like I’d applied a silicone based primer), and not at all red or irritated. Microdermabrasion facials often show their effects a few days after you’ve actually had them, and this certainly was true of the SkinBase offering – my skin looked steadily clearer and brighter for a few days afterwards, to the extent that a friend noticed my glowing complexion and asked what skincare I was using! I did find that a couple of tiny spots surfaced after the treatment, presumably as it deep cleansed my face so effectively, but there were no major breakouts. Incredibly, the treatment took an very speedy forty minutes including a ten minute cooling mask – combined with the lack of redness I experienced, this quick turnaround time makes this the perfect lunch time pick me up, or special occasion prep for the busiest of girls about town. For those with scarring or uneven skin tone, SkinBase recommend a course of treatments a week apart to totally revitalise the skin. I wouldn’t hesitate to have another SkinBase microdermabrasion facial, as it refines and maximises the brightness of my already reasonably clear skin. SkinBase microdermabrasion facials are available at salons nationwide – costs vary, but my facial cost around £40 for a 30 minute treatment and a 10 minute mask. Tried SkinBase, or any other microdermabrasion facial? 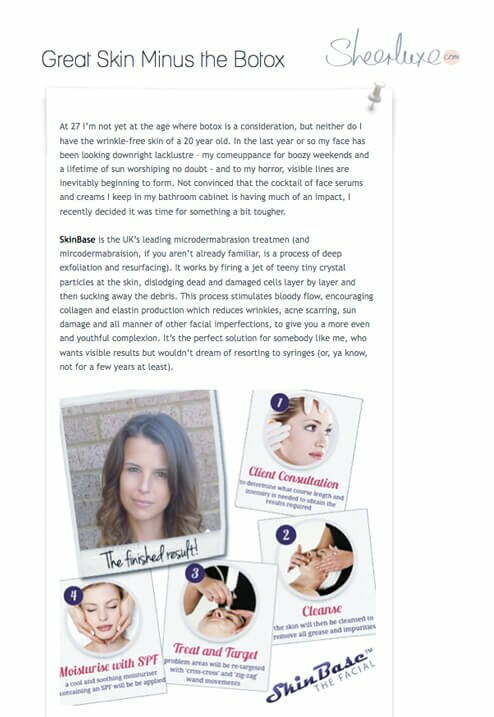 Sheerluxe, the ultimate in online luxury magazines has published a wonderfully complimentary review of The SkinBase Facial. Telling readers it’s the ‘way to get model skin’ and touching on the quick results for the likes of fine lines, acne & acne scarring and sun damage the magazine have now also asked to write a blog about the treatment, sending one of their beauty writers for a course of facials. To say we’re delighted is an understatement – make sure you get booked in now as SkinBase continues to prove it’s the best facial available! Look our for the blog in a few weeks time. Body Fit magazine chose to feature the SkinBase Facial™ as their ‘Treatment of the month’ in the December edition of the magazine. Packed full of health, fitness and beauty news – the magazine features only the best for those looking to get body confidence. We all know that exercise is hugely important for a healthy body, but don’t forget to treat your skin too – keeping you radiant and feeling great. Click here to find your nearest SkinBase Facial™.